Beautiful framed eyes that will make you more confident. Focus makeup is more often centered on the eye, so do not be surprised if you and the majority of women around the world wear eyeliner to reinforce the frame shape of the eye. Eyeliner, there is in the form of a pencil or liquid. In recent times, the cosmetics manufacturer also gives a lot of color choices. Not just chocolate, black and dark blue, but also of other bright colors like blue, green, gray, orange and so forth. In addition, there are also mixed with glitter eyeliner. Do you feel safe with eyeliner that included information secure? Consider again the problems that arise on the part of your eye. If after wearing eyeliner arise itching, redness and discomfort around the eyes, so you can not match and eyeliner are allergic to the product. Immediately discard if you find an allergic reaction after wearing eyeliner, though the price of the product is expensive, you certainly more care on the health of the eye than the price of a bottle or a bar of eyeliner. In addition, note the following tips to keep your eyes safe while wearing eyeliner. Moreover if you wear contact lenses. Many products are mixed with the powder eyeliner glitter. It's very tempting when you're happy to experiment with makeup.Although stated that the product is safe, but the filings on eyeliner it could fall into your eyes. Usually this will make your eyes itch and you're tempted to rubbed your eyes. The little powder can scratch your cornea. Does not mean having a pointed end, because the very pointy end can injure the skin around your eyes. Sure, more comfortable wear eyeliner pencil with a blunt tip so soft and easy to apply. Only, always shaved your eyeliner pencil so far from the end of the timber. The tip is blunt and almost reached the logs can be hazardous to your eyes. Eyes may scratch the tip of timber and huff ... creepy is not it? If you wear contact lenses and want to wear eyeliner, fine. 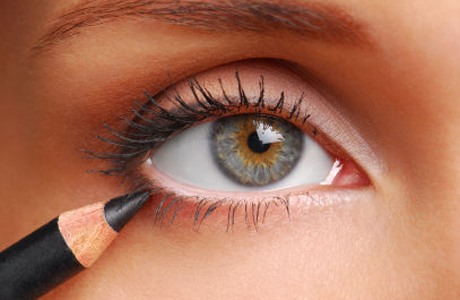 Only, notice that you've been wearing contact lenses before applying eye makeup, including eyeliner you. If you want to remove eye makeup, first off your contact lenses, just remove makeup and eyeliner. This is to avoid residues eyeliner into the eye and contaminate your contact lenses.